completed and its first official trip took place on 20 February 2008. Barcelona. I’ll discuss this later. than 70,000 tickets have ALREADY been sold for future trips. Wow. and 38 minutes but other AVE trains take 3 hours or up to 3.5 hours. other side, all seats face forward. Tourist class seating configuration remains the typical 2 seats on each side of the aisle and no electronic device plug-ins available. I believe all seats face forward in tourist class too. prices are much higher. General ticket price is 179.30 Euros one-way. No cheaper, web-purchase tickets are available for this class. be worth the huge difference in price. The ESTRELLA Madrid-Barcelona night train still exists, taking about 9.5 hours and costing as little as 38 Euros one-way. If price is the deciding factor, AVE train travel wins, costing about 58 Euros less than airplane travel – including presumed taxi costs from/to train-station/airport. If speed is the deciding factor, airplane travel wins, taking roughly 25 minutes less than AVE train. is ALSA. Saves 10-20 Euros but takes, ugh, 4-5 hours longer. My lower back tightens just thinking about it. 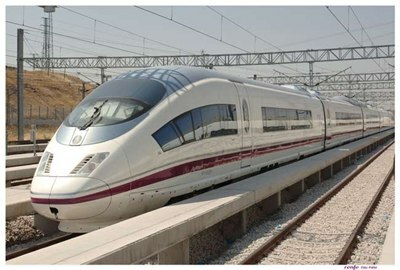 Watch the sparkly 6-minute RENFE Madrid-Barcelona AVE video at http://www.renfe.es/video.html with nice music and visuals. 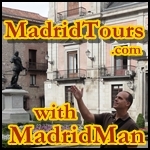 No language spoken but Spanish textual details are given regarding the trip. and pleasure of the trip – including the same at your destination. bus ride or getting on another airplane shortly thereafter. 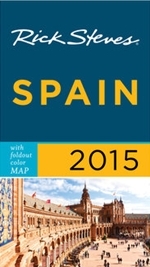 Enjoy Spain’s Vast Train Travel Network! This entry was posted in Travel and tagged AVE, bar, Barcelona, fast, fast train, high speed, Madrid, RENFE, restaurant, train, train restaurant. Bookmark the permalink.